A composting outhouse is a great solution to two common problems for large-scale gardeners and hobby farmers: the need to go back to the house to use the bathroom, and the fact that you can never have enough compost to work into the soil and use as mulch. A compost outhouse solves both these problems--because no plumbing is required, you can build one anywhere, even in a field or garden. While it will take up to two years for the waste to completely decompose, it is a completely organic, sustainable, and abundant source of free fertilizer. Follow the manufacturer's instructions to assemble the prefabricated shed. Line the inside walls with cedar paneling. This will prevent odors and discourage insects. Lay the laminate board on a solid level surface, laminate side up. Put the toilet seat on the board and trace a cut line on the laminate board, using the inside of the seat opening as a guide. Turn the laminate board over so the laminate side is down. Squeeze a generous spot of wood glue on the end of one of the posts. Position it, glue side down, on the laminate board, and hold firmly for one to two minutes. Repeat with the remaining three posts. Position the 40-inch boards along the long edges of the laminate, between the posts. Use wood glue to glue them in place. Allow the glue to cure according to the manufacturer's instructions. Position the 22-inch boards perpendicular to the 40-inch boards, about 3 inches on either side of the cut line. Glue in place, and allow the glue to cure. Turn the structure right side up, so it is resting on the four corner posts. Use the power screwdriver to drive 8-inch screws through the laminate board, into the 4 corner posts. Drive 1-1/2-inch screws through the laminate, into the 40-inch and 22-inch bracing boards. Use the jigsaw to cut along the cut line, opening a hole in the laminate board. Follow the manufacturer's instructions to screw the toilet seat to the laminate board, making sure it is lined up with the hole. 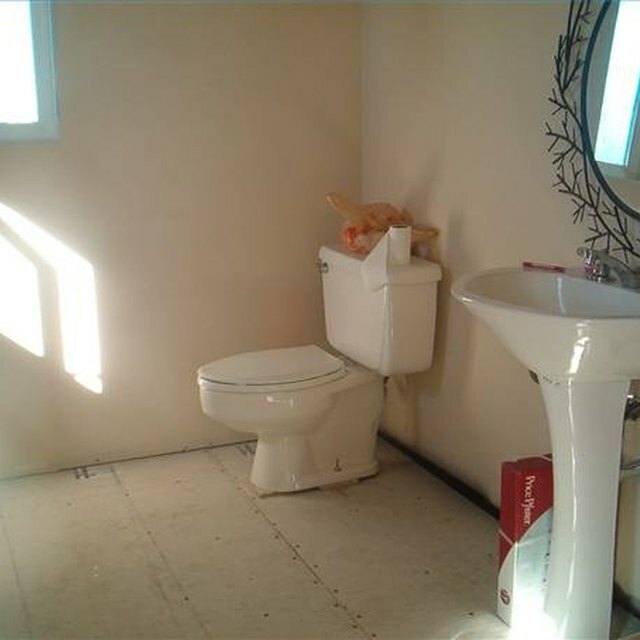 Move the toilet structure into the shed. Slide one 50-gallon storage bin with the lid under the hole of the toilet. Fill the 5-gallon bucket with sawdust and put that inside the shed as well. Put the second 50-gallon bin outside the outhouse. Before using the toilet, take the lid off the storage container below the toilet structure. After using the toilet, shake a handful of sawdust into the storage bin to suppress odors, soak up liquid, and aid in decomposition. Put the lid back on the bin. Every few days, pull the bin out of the shed and use a pitchfork or shovel to thoroughly mix the waste. This aerates the waste to prevent odors and speed up decomposition. When the first bin is full, move it outside and replace it with the second bin. Leave the full bin to finish decomposing, mixing it weekly to prevent odors. Within a year, the waste will fully decompose and be ready to use as mulch or a soil amendment. The more you aerate the waste, the faster it will decompose into useful compost. Use plenty of sawdust when you use the composting toilet. It will prevent odors, and add carbon to the eventual compost.